Porsche Design Chronotimer Rennsport Reunion VI Limited Edition watch. Beginning this month, Porsche Design’s newest Chronotimer Rennsport Reunion VI Limited Edition watch — designed to celebrate motorsports — is available for pre-order on line. Each Official numbered timepiece commemorates the sixth Porsche Rennsport Reunion. The Reunion is a mecca of sorts for Porsche aficionados, and takes place in September. The new Porsche Design Chronotimer Rennsport Reunion VI Limited Edition is created exclusively for the event as the official commemorative timepiece of RRVI, and is the third edition Rennsport Reunion watch from Porsche Design. 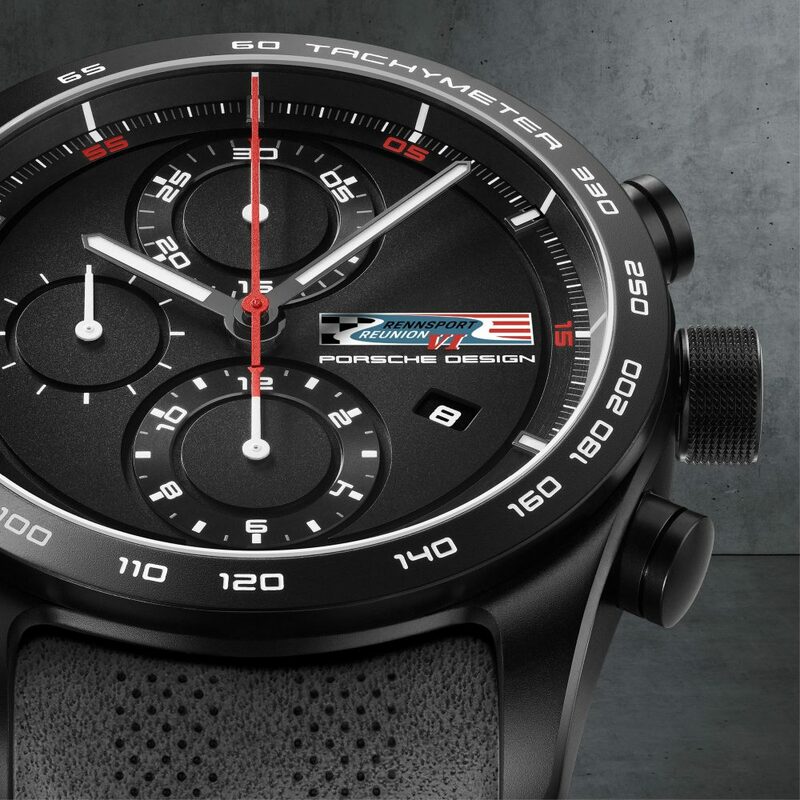 The 2018 limited edition timepiece is available only in the United States and just 70 pieces, correlating with the 70th Anniversary of Porsche Sports Cars, will be made. The Chronotimer is reminiscent of the legendary Chronograph I –– the world’s first all-black chronograph, inspired by the non-reflective matte black instrument panels on the dashboards of Porsche racecars. 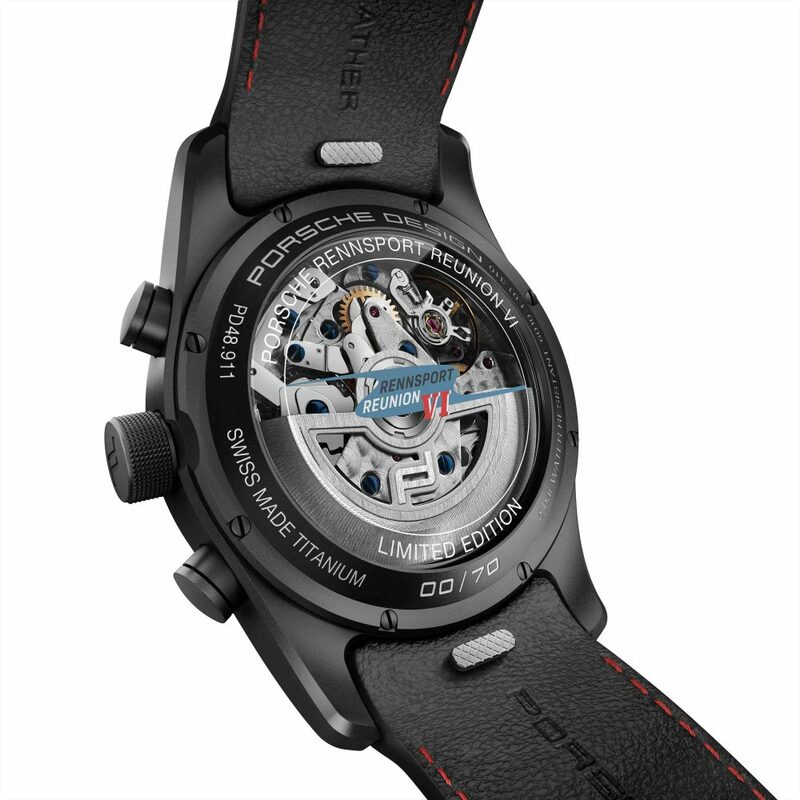 Featuring Porsche Design’s unique titanium case with black titanium-carbide coating, the Chronotimer Rennsport Reunion VI Limited Edition utilizes a matte-black dial to ensure maximum contrast and readability. Accented by racing’s red and white markers and stop-seconds hand, the dial displays the Porsche Rennsport Reunion VI logo at the “3 o’clock” position. Additionally, it is engraved with the ‘Porsche Rennsport Reunion VI Limited Edition’ logo and number. Porsche Design Chronotimer Rennsport Reunion VI Limited Edition watch is a chronograph with tachymeter bezel. The watch features a sapphire caseback for viewing of the chronograph movement with Porsche Design rotor.. The black calf-leather quick-change interchangeable strap is made from original Porsche interior leather and yarn, and features contrasting red stitching and a titanium double-folding clasp with black titanium-carbide coating. 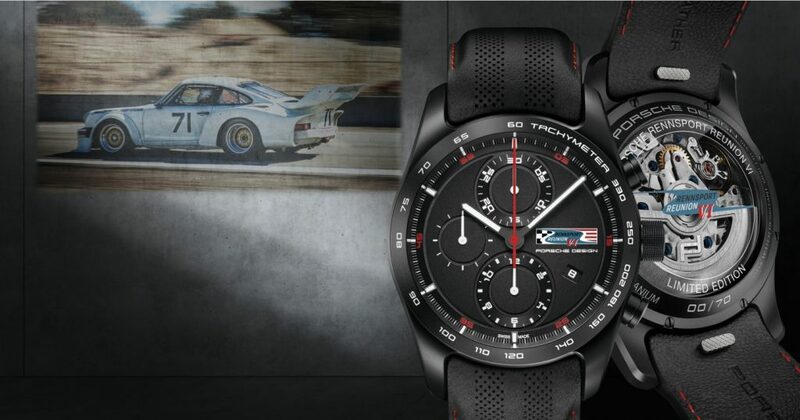 The watch is sold in a limited edition collector’s box, including a numbered Rennsport Reunion plaque and special booklet, telling the history of Porsche Rennsport Reunion, Porsche Design, and the official timepiece itself. Porsche Design Chronotimer Rennsport Reunion VI Limited Edition watch celebrates 70 years of Porsche. Porsche Rennsport Reunion began in 2001 at Lime Rock Park in Connecticut. It was last held in 2015 at Monterey Peninsula racetrack and attracted nearly 60,000 visitors. Rennsport reunion is the world’s largest gathering of vintage and recent Porsche racecars, showing their cars both on and off the track. The event this year is hosted by Porsche Cars North America. Porsche Rennsport Reunion VI takes place September 27-30, 2018 at Laguna Seca. The Chronotimer Rennsport Reunion VI Limited Edition is available for pre-order starting in June 2018, and retails for $6,800 (RRP). It will also be sold in the USA at the Rennsport Reunion VI if it has not sold out on line by then. 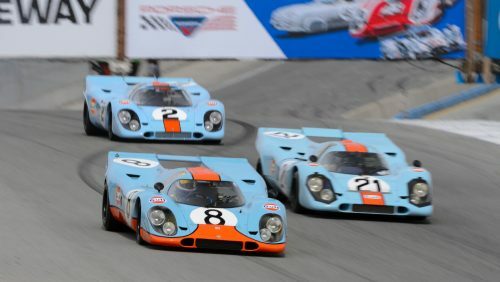 This year’s Rennsport Reunion will take place in Laguna Seca in September. Expected to be available at the beginning of September.